President Barack Obama uses a MacBook Pro 15″ with antiglare screen, and it looks like the entire White House staff uses Macs too. The topmost picture is from a White House video and the other image of White House staff is from Fortune. Practically everyone has an iPad — or will have one very soon. Emanuel just got his, as did senior adviser David Axelrod and deputy press secretary Bill Burton. Communications Director Dan Pfeiffer and press wrangler Ben Finkenbinder each have one on order. Economic adviser Larry Summers takes his to staff meetings. The device is the hot, new White House toy, a gizmo that is popping up around Washington but seems to be particularly in vogue at 1600 Pennsylvania Avenue. 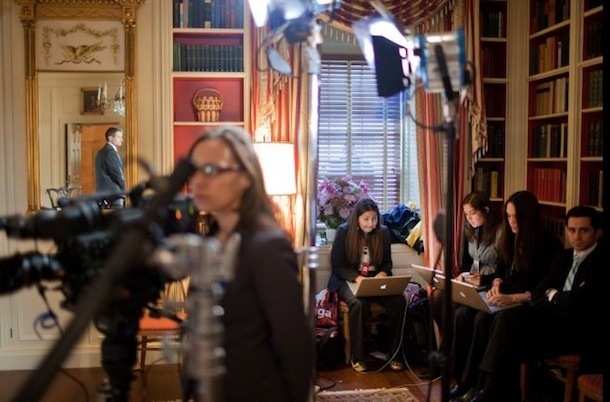 I’m sure members of the White House just uses their Macs and iPads for work though… no Facebook, Angry Birds, or StarCraft 2 in those long West Wing meetings… suuuuuuuure. Many other politicians and famous political figures also use Macs and Apple hardware, including Obama predecessor President George W Bush, so this is likely no surprise to many people. Nonetheless, it is interesting to note that many people use the same computers and technology, regardless of their jobs. Even a huge number of college freshmen use Macs, so the platform is obviously popular far and wide. It’s even so, that since Obama and his gang want to use macs the NSA had to learn how they work because up till then, when Obama took office, they only knew about PC’s and thought Macs were outdated unreliable computers. They at first refused Obamas wishes to adapt to Apple because of it. Exactly. The disparity between people who actually “know” how a computer works and who has no idea is growing. People need to exercise their brain more and not have everything spoon fed to them from China. Oh jeez, I’ll throw my $4000 Mac Pro out the window! Of course. OSX is more secure than Windows. a custom Linux would be more secure than OSX. A properly configured OS X is more secure than a standard OS X – and 15 times more useful as a desktop OS than any linux distro unfortunately – which is why it’s still a fringe OS as a desktop. Certainly dominates the server field though – every one of my servers runs linux.